For many people, a smartphone is their main interface for checking e-mail, but the native mail app bundled with phones often doesn’t deliver the features that users demand. Luckily, there is no shortage of alternatives. 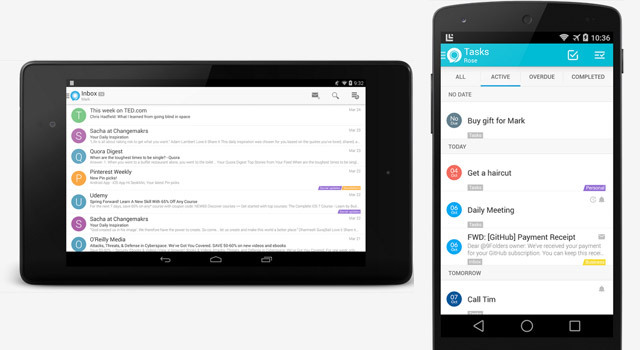 Recently, Google unveiled an app meant to make managing Gmail easier. Although it’s pretty, Inbox has not found favour with all users. Indeed, it’s not only aesthetics that make an e-mail app great. We have curated a list of five of our favourite apps. Try them all, or pick only one. What’s your favourite? Have we missed it? Use the comments box to tell us. CloudMagic has won numerous awards. And it’s not hard to figure out why. The app works with almost all e-mail accounts, including Gmail, Exchange, Yahoo, iCloud, Google Apps, Office 365 and any IMAP account. The developers focused on design and readability of e-mail and the user interface resembles the flat design that has become so popular lately. Users concerned about security will also love the added passcode that protects e-mail accounts. By swiping a message, a list of actions is revealed to allow you to archive, delete or move it. You can also set reminders on each e-mail by selecting one of the options that pop up. CloudMagic, which is available for both Android and iOS, also offers the ability to categorise mail using a system called cards, which allows you to declutter your inbox quickly. Get the software. Acompli is a task-orientated e-mail app for both Android and iOS that relies on swipe gestures to manage users’ inboxes. It features a fully integrated calendar, and e-mail messages can be scheduled for later sending. Heavy calendar users will love the ability to share available times with people wanting to schedule a meeting. 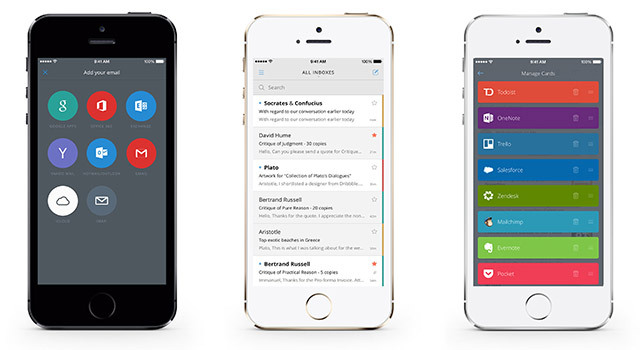 The app also has the ability to keep your most important e-mails at the top of your inbox stack. Acompli features an enhanced e-mail attachment system that makes it easy to attach any file located on your device or in the cloud, with support for Dropbox, Google Drive and Microsoft OneDrive. This app works with Exchange, Office 365, Google Apps, Gmail, iCloud, Yahoo, Outlook.com, Hotmail, MSN and Live. Searching for a particular mail is also a little easier with its advanced search functionality, which finds e-mail much more efficiently than many other apps we have used. Get the software. 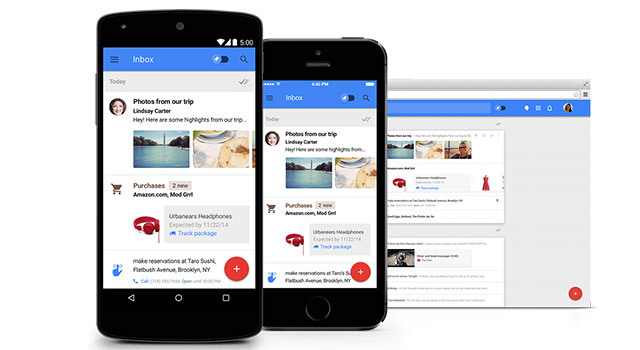 Inbox by Gmail is the latest entrant into the e-mail app market. The app was developed by Google and only works with Gmail accounts. Google Apps for business is not yet supported. Inbox focuses on making the reading experience more akin to browsing a social media feed. This means attachments and important information in e-mail are brought to the fore, making mails quick to read and archive or delete. Inbox also bundles messages together, similar to Gmail’s “social” and “promotion” tabs, which sort mail based on type. The app also focuses on the to-do list, allowing users easily to add reminders that are stored at the top of the inbox. Messages can also be snoozed, to be read later. Because Inbox is tightly integrated with Gmail, it works like an extension to Gmail’s Web interface. Inbox is not for everyone, but it certainly makes managing a clogged Gmail account easier. 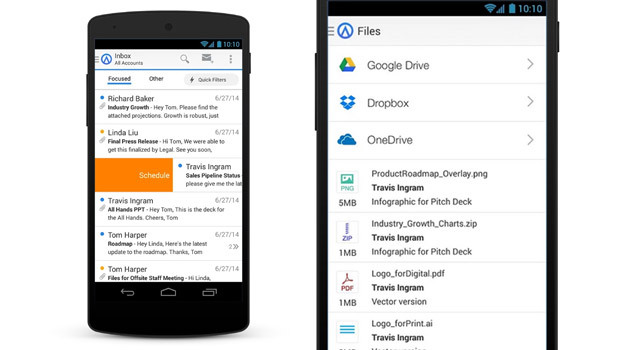 Inbox is available for Android and iOS as well as the desktop via Chrome. Get the software. Nine, made by 9Folders, is our favourite Android app for connecting to Exchange (note that there’s no iOS version). Nine synchronises with Exchange using ActiveSync and integrates calendars, contacts, tasks and reminders nicely with Android smartphones. Outlook users who use subfolders in their inbox will appreciate Nine’s favourite folders, a feature that allows you to sort messages easily. It is Nine’s simplicity that makes it so appealing to users and should be considered a default on Android devices. It may not be a free app, but for Exchange-based e-mail accounts, Nine outshines its competitors and is worth the R110 or so it costs at the current exchange rate. Get the software. Get the software. Mailbox is a minimalistic e-mail app that was designed following the observation that many people use their e-mail as a to-do list. 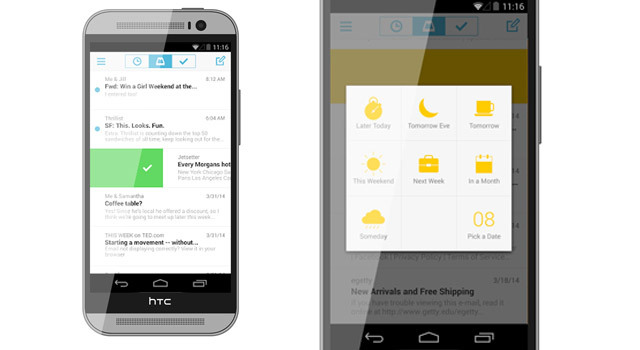 It was started as a to-do list app, but was redeveloped as a mail app with a heavy task-orientated feature set. The software allows you to handle your mail like you would do a to-do list. E-mails can be snoozed to be read later, or swiped away to archive or delete. Users have a selection of snooze options to choose from, including later today, tomorrow, or in a month from now. Threaded message conversations can also be muted to keep inbox clutter free.